Even cult hits of dubious quality are worth remembering. "More often than not, seemingly unpopular films are forgotten and lost forever unless someone acts quickly to preserve it," Steven Applebaum of the Super Mario Bros: The Movie Archive told the Star News Online. "For example, Blade Runner (which one could say is Super Mario Bros. closest cousin) took quite a few years to become a cult hit after its lukewarm theatrical release." Comparison of Ridley Scott's landmark 1982 sci-fi flick to the SMB film aside, he does have a point. As actors like Dennis Hopper (who starred in the film as the king Koopa) pass away, films like Super Mario Bros. would just "have remained a quirk in film history" if no attempt was made to remember them. That's the entire point of the SMB: The Movie Archive, and it's for that reason that the Archivists are returning the movie to the big screen for its 19th anniversary - once in Wilmington, NC on Thursday, June 21, and in Seattle, WA on the 22nd and 23rd. These screenings, as well as showings in New York City and Los Angeles earlier in the year, are the first time that Super Mario Bros. has been in theaters since its original 1993 release. Between Seattle, NYC, LA and Wilmington, one of those seems a bit out of place. But the SMB movie was originally filmed in the Wilmington area, and Applebaum says that locals who worked on the film will be on hand for the screening - as will some props and items seen in the final project. Personally, I'm hoping for those jump-boots Mario and Luigi used at the end. According to Applebaum, one of the biggest surprises about the SMB: The Movie Archive screenings was learning how much people who worked on the film - which, let's face it, isn't considered a masterpiece - genuinely enjoyed it rather than casting it off as an old shame. "It's a popular perception that everyone hated what they were doing when in actuality they were just making the best with a project everyone believed to be something special. They still see it as something with potential." If you're in Wilmington NC, the screening will be at the Thalian Hall Center for the Performing Arts at 7:30 PM on Thursday the 21st. If you're in or around Seattle, there will be two performances on June 22 and 23 at the Egyptian Theatre, both at midnight. Tickets can be ordered online here and here, respectively. 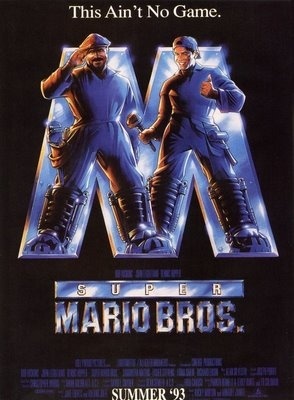 The last time I watched the Super Mario Bros movie was back in college, and I admit I had a fun time with it. To be fair, I'd also had like six White Russians at the time, but it was enjoyable all the same.